Happy Holidays to everyone and happy hosting! This time of year we may find ourselves hosting more then normal. It is such a joyful time to be with family, friends, and those we care about. When it comes to hosting, keeping the foods we serve on the healthy side can be easy, delicious, and nutritious! Not sure where to start? I have 5 easy tips how to keep hosting healthy and super easy so your guest will be completely satisfied and happy campers. If you have overnight guests or hosting a breakfast gathering think fresh and balanced with colorful choices guests will drool over. Move over heavy breakfast casseroles and enters one of my favorite hosting tips, make a healthy holiday breakfast bar. I love doing like a parfait bar packed with healthy options like fresh fruits, nuts, seeds, granolas, museli, coconut, or yogurts. Another idea would be a healthy scrambled egg bar. Naturally downsizing serving bowls or plates will also be an easy way to help your guests keep portions under control yet still enjoy all the food. Try swapping out ingredients for healthier alternatives when possible. One example would be if making muffins or breads consider swapping out ingredients like regular unbleached flour for almond, coconut, or whole what flour. Easy swaps that pack a healthier punch can make a difference. There are so many choices when it comes to entrees but one of my favorite and easy options is a large chilled whole grain and greens salad. This is an quick way to feed a crowd plus budget friendly and satisfying for everyone. I love using chilled whole grains which are easy to batch cook and versatile in many ways. In a big, colorful green salad powered with a whole grain like Bob’s Red Mill farro used in this salad is a great way to add more texture, fiber, and nutrition. 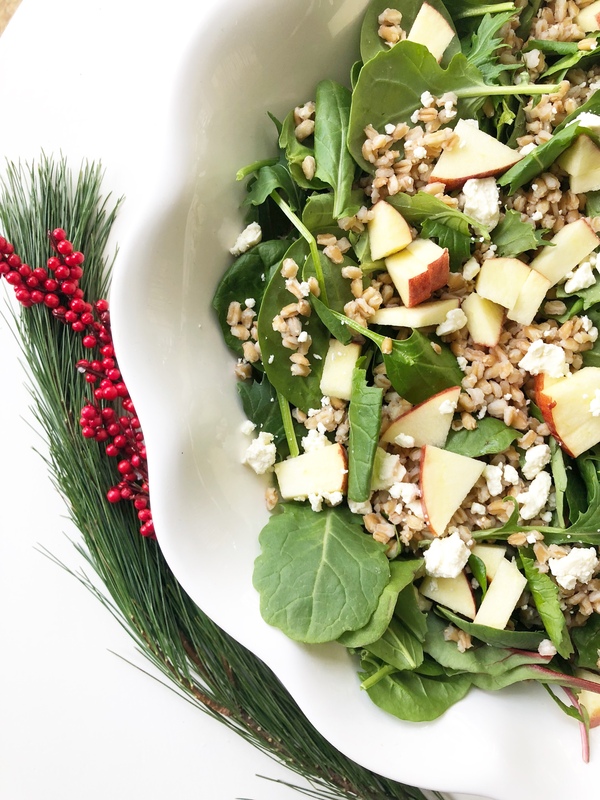 This I salad is a mix of chilled farro, mixed greens, red apple, and feta cheese. Adding a layer of protein if desired is also a good way to pack even more protein and bulk to the meal. Bulk salads like this are so versatile and guests might just have room for a little healthy dessert. I encourage to get creative, try different whole grains mixed in a large salad with fruits or other vegetables, a salad like this will go a long way when feeding a crowd on the healthy side. It can be tempting to mindlessly nibble at a holiday gathering so why not make it easy yet tasty for guests when it comes to snacks, Out of sight, out of mind is a super way keep the holiday treats to a minimum but lets face it, there is going to some holiday yumminess hanging around. Try keeping some of the less nutritious options further away in the house or in a different room so access just takes a little more effort or plan to serve just a few treats for a certain time period then put them up. Not sure what to serve for healthy snacks? Try making a popcorn mix sweet ,savory or salty that guests can nibble on and feel satisfied. Popcorn is whole grain and serving size is up to 3 cups, in this recipe I tossed together Bob’s Red Mill popcorn, dried cranberries, and a few semi-sweet chocolate chips. Instead of opting for the typical store bought Chex mix, making a popcorn mix is a again very versatile, budget friendly, and good to feed a crowd. 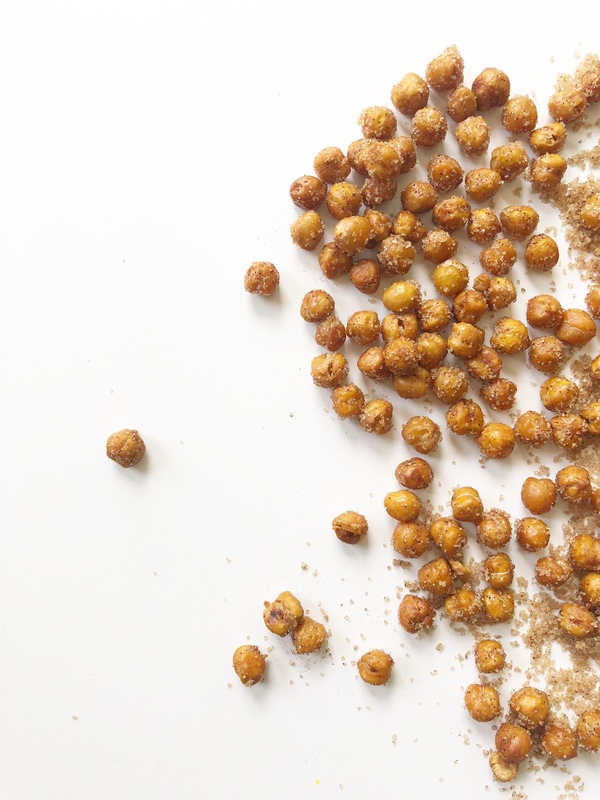 Roasted chickpeas is another crunchy and healthy snack option that is easy to make. This recipe for roasted chickpeas is savory packed with a protein and fiber punch to keep guests satisfied on the healthy side. Another healthy snack favorite I always love to serve is a healthy dip like hummus or guacamole or any healthy dip that pairs with fruit or colorful vegetables. This is a great way to keep snacking fresh, full of color and nutrients. I talk about hydration all of the time but in the midst of the fun and festive holiday beverages, water is the most important beverage to maintain throughout the day. It’s easy to feel like we don’t need as much water in the winter months unlike the summer months but we do since the the body can easily get dehydrated. Enters Jingle Water, As a host serving water does not have to be boring or tasteless. I love making what I call jingle water for guests. 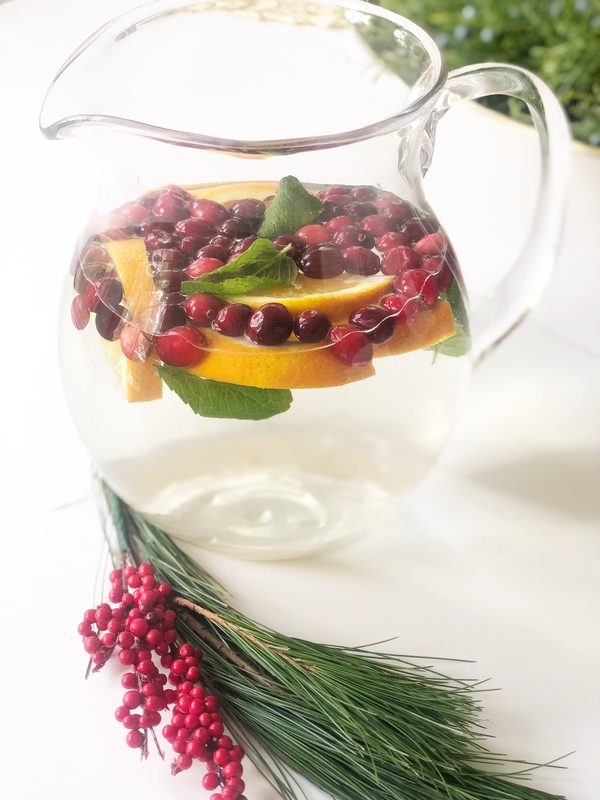 Freshly flavored water is again versatile but for a holiday crowd try making this Minty Cranberry Orange water for guests to sip. The water is not only eye appealing but it is so refreshing and extra special from plain water. I encourage to be creative with water and try what works for you and your crowd but this jingle water is a crowd favorite. Desserts are a fun part of the holidays but not all desserts are created equal. In a sea of dessert goodness, desserts can add up fast on the waist line and the new year may look a few pounds heavier if over indulged. As a host, making a pretty, delicious, and nutritious dessert is a good way to help guests satisfy that sweet tooth and keep unwanted holiday wait at bay. 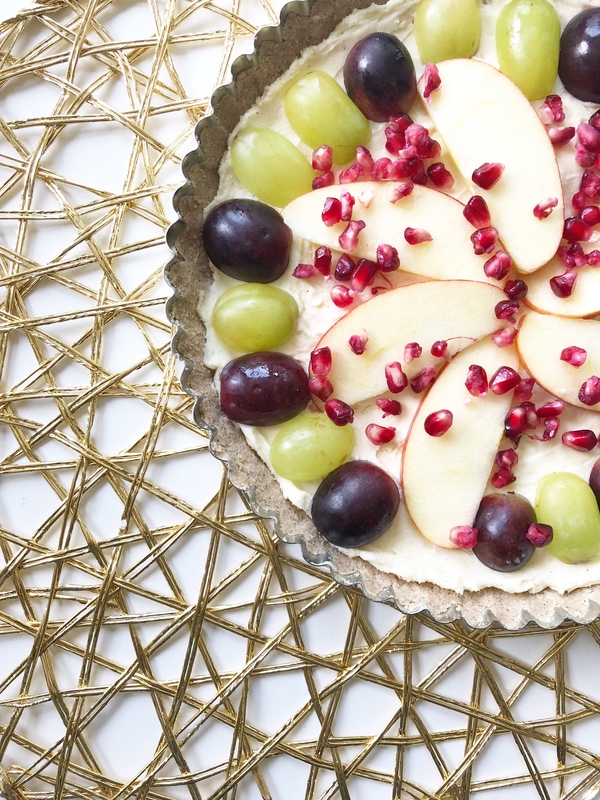 First, I always go for desserts that incorporate fresh fruits, like this fruit tart. Very light, refreshing, and not going to pack whopping waist popping calories. Secondly, I always swap ingredients when I can for a healthier version. In this tart and the chocolate muffins, I used almond flour in place of unbleached regular flour which instantly lowers carbohydrates and is gluten free. I also used a clean, raw cacao powder in the muffins in place of a more processed powder. Simple swaps and keeping it fresh can lighten up desserts fast and still keep guest happy. I hope everyone has a wonderful holiday season whatever the celebration, sending lots of holiday love and light.